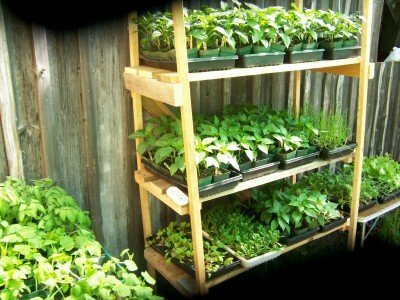 A backyard nursery can be a profitable home business for the new grower or would-be small farmer. I found out this spring that people seem to pay more for ornamental plants than the ones they can eat! You can take advantage of this odd fact by growing and selling plants for money. And of course, the somewhat surprising fact that plants you can't eat seem to sell for more than those you can. Higher margins, more cash in my pocket. FARMING AND GARDENING RESOURCES . . . These facts convinced me to give the business a try. Here's some pointers if you are thinking about starting your own home-based nursery business. If you've read anything on my site about starting a market garden you know that I strongly recommend a four-step process to start any business. The four-step process is Planning -> Marketing -> Management -> Production. This process is no less valid when starting a backyard nursery business. The planning phase is where you set targets for your business, estimate your sales and expenses, research the kinds of plants that are popular in your area, and what they sell for. You also need to to look into local bylaws and zoning restrictions that may affect your business, as well as any licensing requirements. Don't neglect the fact that you will probably need liability insurance. DO NOT start without taking this step; you don't want your fledgling business shut down by the guv'mint just as you are making some money. It would be a good idea to go to a couple local farmer's markets or flea markets that have plant sellers. Take a look at their stock, and see what advice they can give you. With these goals in mind, now comes management. This is all about figuring out your schedules and location and methods for growing and selling your plants profitably. When do you need to start your plants to have them at optimum age for display and sale? What kind of care will they need? Who will do the work? Finally, with all this figured out, you start production: the day to day care and feeding of your nursery plants. CAUTION: do not start this process the other way around; that is, by growing a bunch of plants and then trying to figure out how to sell them. This is a sure way to failure for your small business. Before you re-launch your empire, make sure your market can accept more of your nursery plants. Will you have to sell at more than one market to make your sales goals? Remember that time spent at the market is time you don't have for caring for your plants. Also, be aware that growing a few hundred plants of limited varieties is very different than growing the many thousands of plants that are found in a commercial nursery. Your home-scale growing techniques will probably not be efficient at a larger scale. You may have to invest in automation e.g. irrigation systems, misting boxes, thermostatically-controlled fans. Be sure this investment will pay off. 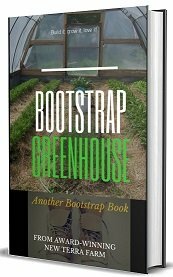 Just released for 2019 - build your own Bootstrap Greenhouse using any of our three designs. Only $9, and only from New Terra Farm!